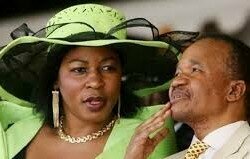 REGINA Chiluba, wife to the late president Frederick Jacob Titus Chiluba, has decided to open a foundation in honour of her husband who died five years ago. “We hope to take some hectares of land and build a shelter for the children because we have continued visiting some of the children. We support them, take them to school; it is not so big but we provide shoes, uniforms and things like that. We manage to support a few children,” Mrs Chiluba said. She said on her husband’s third anniversary she decided to go out to feed orphans and donated assorted items. “We mobilized ourselves, we looked for blankets and we had a big meal for the children. I thought that was the best way to remember my husband; from that time I have continued visiting most of these homes,” she said. She said she has not sat idle but had decided to continue with the vision of her late husband. “I know that he loved people and he loved children,” Mrs Chiluba said. She said she has already registered the foundation and was currently doing some ground work. Mrs Chiluba thanked President Edgar Lungu and First Lady Esther for the support they have continued rendering her and her children. “The Lord has been wonderful. Llike he says he establishes the widow. We have had very difficult times. I remember two of my children, my brother and my niece and a friend were coming from Ndola on the 18th and they were involved in a very bad accident.So one of my children was admitted for close to three months but then her legs were still quite wobbly and she is diabetic as well,” she said. Mrs Chiluba said the accident was a difficult time as she had to take her daughter to India for specialized treatment with the help of President Lungu and his wife. “We had to go to India and God bless Lungu and the wife; they come up for us, they gave us the funds. Moses Katumbi also gave us some funds to help us and I would love to thank them most sincerely. “I have not had a chance to sit down with Ba Esther Lungu and President Lungu to personally thank them but I would appreciate if you would thank them for me through your paper because that was very challenging. I thought my daughter was going to die so I picked up the phone and I spoke to the First Lady and they just helped,” Mrs Chiluba said. Legal editor Joshua Rozenberg has questioned how Smith could “continue” as a judge following scarthing criticism from the Court of Appeal. The judge’s recent blunder – a ‘shocking’ and ‘disgraceful’ letter to a leading barrister – is the latest in a long line of errors. The judicial conduct investigation office is already investigating Smith’s behaviour in the British Airways case as well as the letter he sent to Blackstone Chambers. A senior judge will advise the Lord Chief Justice. There is no doubt that Smith is guilty of misjudgment. But he can be sacked only if he is guilty of misconduct. And that would require an address presented to the Queen by both houses of parliament. No high court judge in England and Wales has ever been dismissed in this way. Not so far, anyway. Any friends Smith may have on the bench will now be advising him to jump before he is pushed. He should take no comfort from the fact that the allegation of apparent bias was not made out. The letter he sent to Blackstone Chambers is as clear an example of misconduct as one could expect to see. It’s not just Pannick who thinks Smith is unsuited to be a judge. I wrote a column in 2007 saying it was time for him to leave the bench. The time has surely come for Mr Justice Peter Smith to leave the Bench. A judge is nothing if he or she lacks judgment. But this is precisely the attribute that Sir Peter Winston Smith, 55, has recently failed to demonstrate. Though he has not made any public announcement about his health, it is widely known within legal circles that Sir Peter has been having tests for a “serious illness”. I hope that these tests will prove negative. But I do not see how he can recover from what we learned about him last week. After teaching law at Manchester University and practising on the Northern Circuit, Sir Peter became a judge of the High Court Chancery Division five years ago. He is best known to the public as the judge who heard the Da Vinci Code case last year, dismissing a breach-of-copyright claim against the best-selling author Dan Brown and burying his own coded message within the 70-page ruling he delivered just three weeks after the hearing. The Court of Appeal has slammed Judge Peter Smith’s astonishing letter to Blackstone Chambers’ head Anthony Peto QC, branding it “shocking” and “disgraceful”. Master of the Rolls Lord Dyson, Lord Justice Moore-Bick and Lord Justice McFarlane — ruling in the case of Harb v HRH Prince Abdul Aziz Bin Fahd, in which Smith originally presided over — took the opportunity to have a pop at the outspoken judge’s behaviour. The judges describe the letter — in which Smith states he “will no longer support” elite London set Blackstone — as showing “a deeply worrying and fundamental lack of understanding of the proper role of a judge”. What makes it worse is that it comes on the heels of the BAA baggage affair. In our view, the comments of Lord Pannick, far from being ‘outrageous’ as the judge said in the letter, were justified. We greatly regret having to criticise a judge in these strong terms, but our duty requires us to do so. The incredible missive — which Legal Cheek obtained courtesy of leading legal journalist Joshua Rozenberg last month — was penned by Smith in 2015, in response to an article published in The Times (£) by Blackstone’s David Pannick QC. The article was particularly critical of Smith’s handling of an unrelated case. However, despite the inappropriate letter, the Court of Appeal ruled that Smith was not biased when he made his judgment in the case of Harb v HRH Prince Abdul Aziz Bin Fahd. Ordering a retrial nonetheless, the court did say that Smith had “failed to examine the evidence and the arguments with the care that the parties were entitled to expect”. We have little doubt that most, if not all, litigants represented by a member of Blackstone Chambers, knowing of the article, would prefer to have their case heard by another judge. We are prepared to accept that some, indeed many, might have very strong feelings on the subject. We think it fanciful to suppose that the judge made major changes to his assessment of the evidence simply as a reaction to the article or that his decision on the agency issue owed anything to a bias against the Prince.